Do you ever look back and think about the little moments that change lives? You wonder how different your life would be today without those moments. For some of us, it could be as simple as walking into a restaurant where you end up meeting your best friend. For others, it could be that decision you made to apply for a job where you’ve now been for the past five years. Without those small decisions, your life would likely be on a significantly different path. Here’s a quick story before jumping into my FinCon 2018 recap. Back in 2002 I had one of those life altering moments. After two years of attending community college, I had planned to transfer to a local state school in somewhat disappointing fashion. It meant that at least in the short-term I’d be living at home while many of my friends were off having a great time at big four-year universities. For two years of college I worked really hard with the goal of obtaining a baseball scholarship to a NCAA division 1 or 2 university. Settling for anything less wasn’t an option. I sent out dozens of letters, attended tryouts, cold-called coaches, and out-worked most of my teammates. Yet there I was, at the end of two years of community college without an offer. Instead I enrolled at the local university with the hope of walking onto their team. I felt like such a failure. Then it happened. One of those small moments that changed my life. The Friday before school started a friend called. His school needed an outfielder after one of their scholarship players backed out last minute. The coach called the next day, and within a week I had picked up and moved to that school four hours away. At that point I hadn’t even declared a major. When my coach called to sign me up for classes I didn’t know what to tell him. He ended up enrolling me in a bunch of business classes and shortly thereafter I started taking a strong interest in finance and economics. How different would my life be today if not for that one phone call from my friend? Would I have eventually met my wife? Would I be working the job I’ve been in for the past 11 years? I wonder if I even would have graduated college. At that point in life the only reason for taking school seriously was baseball. My life likely would be so much different today if not for that call. It kind of hurts my head to think about it. Scrolling through Twitter one day I came across a post from Rockstar finance. There was an offer to apply for a FinCon 2018 scholarship. At the time I had only been blogging for about six months. Why would I be someone worthy of getting a scholarship to attend FinCon? I had no plans to attend and eventually put my phone down and went to bed. A few days later I came across a similar message. Again, no action was taken. After the third or fourth time, something compelled me to finally complete the form. I didn’t tell anyone, not even my wife. Of course I wasn’t expecting anything from it. You can imagine my surprise when the email came in on June 25th with the subject “#FinCon18 Scholarship”. Was this real? A $500 FinCon pass for free? Mrs. FP was supportive in my decision to attend and we found a way to make it work. After recently paying off our house, we used it as a celebratory trip. After FinCon we spent a day at Universal Studios and then a few kid-free days at the beach in Fort Lauderdale. I’m confident that decision to apply for a FinCon scholarship was another one of those small decisions that will change my life. I’m still not sure how, just as I didn’t know the impact when my friend called me about the baseball opportunity 16 years ago. However, I’m confident that five years from now I’ll look at the decision to apply for a FinCon scholarship as a pivotal moment. After making the decision to go to FinCon there were so many questions. Reading through blog recaps from former attendees was really helpful to learn about the dos and don’ts. Hopefully, my thoughts below will be helpful to future FinCon attendees. Not weird in a bad way. But weird in a “I read your blog, follow you on Twitter, or listen to your podcasts” kind of way. It’s weird to shake someone’s hand and say, “nice to meet you” when you already know so much about them. Some of these people I genuinely felt like I knew on a personal level and had to remind myself that they probably have no clue who I am. Thankfully, everyone in the community is awesome and supportive and everything else you would expect from great human beings. Don’t do what I did and miss the first day of FinCon. I got in late Wednesday night and therefore missed the entire first day. To make matters worse, I screwed up my reservation and didn’t realize it until on the way to the hotel on Wednesday evening. Thankfully the hotel staff was able to find me a room late on Wednesday night a few minutes away. All day Thursday it felt like playing catch-up. I went from session to session and barely met anyone in the community. Without much of a plan I found that finding people I wanted to meet was challenging, especially since I am anonymous. On the positive side, I ended up meeting a lot of great people that I had never interacted with online. In some ways, that was one of my favorite days given the new connections. You’ll hear some of the more experienced attendees talk about how they barely attended a session all week. That works for them because if they’ve been around for years they probably won’t get as much out of the sessions, and will benefit more from the relationships. As a first time attendee you can get the virtual pass to view the sessions online afterwards, but being in the sessions allows you to meet people on accident. You can also stick around after the sessions and introduce yourself to the speakers. This is also where I met many others unexpectedly. By showing up a few minutes early, I made connections with people that sat around me. Friday was a light session day so my suggestion is to use that day to attend fewer sessions and introduce yourself to as many people as possible. This is mostly advice to myself because I was a lot more intimidated than expected. I am really awful at introductions, and it takes a lot of mental energy to work up the courage to say hello to someone for the first time. My over analytical mind kicks in and I start thinking through all kinds of crazy scenarios. What if they’re busy? What if they don’t like me? What if I sound like an idiot? There were so many people to meet, and I did meet many, but I also feel like I missed a lot of opportunities because in all honesty I was a bit intimidated and overwhelmed. Imposter syndrome is a real thing. Keep in mind, anyone that I did talk to was super nice and helpful so there was no reason to think like this but you can blame my monkey mind. I know what you’re thinking, the section said to go to all of the sessions and this one says there were many people that I missed out on meeting. As a first timer, I still think there was more benefit to attending the sessions and learning about the topics and meeting people coincidentally. Those were some of my favorite interactions. I didn’t end up getting the food pass, but kind of wish I did as a newbie. I didn’t hear anyone raving about the selection, but as a first timer it would have afforded the opportunity to meet with more people. There was a grocery store within walking distance of the hotel so I grabbed breakfast and lunch food (and a few beers), and also had dinner at the hotel’s restaurants a couple nights. Dress code is somewhere in between casual and business casual. The first day I wore jeans, a collared shirt, and dress shoes and that seemed about right. By the final day I was wearing tennis shoes and a t-shirt and that was probably a bit too dressed down for me. A lot depends on your style and brand. Room temperature was a little cold but not too bad. The first day I got cold sitting in sessions all day, but the other days where I was up and moving around more the temperature was about right. Most conference centers are on the cool side so be sure to dress appropriately. Mrs. FP joined me on Friday night so I had a mix of being on my own and having someone there with me. She didn’t have interest in attending any of the sessions so we didn’t get her a ticket. However, she was able to attend the Plutus Award and closing party. Overall there was a mix of people who traveled alone, brought spouses or even children. Deciding to attend with a significant other is a personal decision. I would recommend it as I wanted her to experience the FinCon magic, but that’s just me. After not meeting too many people on Thursday, several of us that received scholarships and other members of the Rockstar Finance met up early on Friday. 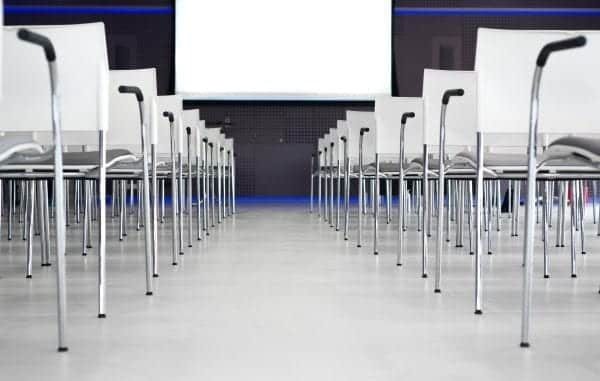 I had the opportunity to chat with several people in the community including Damn Millennial, Joel @ fi180, Mr. Jamie Griffin, ReachingforFI, Poorer than You, Winning Personal Finance, Dr Nikki Ramskill, Peerlessmoney, The Frugal Fellow, The Wealth Hound and so many more. I know I’m probably missing a few people who were part of the meet up. This list doesn’t include the dozens (hundreds?) of others I had the chance to interact with during the week. There are way too many to list. I wish I would have been more proactive in connecting with others earlier in the week, but again arriving a day late put me behind. Leading up to FinCon next year I will be sure to have a plan in place of who to connect with. One of my absolute favorite parts of FinCon was the conversation I had with my assigned mentor, Stefanie LaHart at BoomTown Marketing. She challenged me to think differently about the purpose of my blog. She gave some great advice on how to be different. And also how to write about what is true to myself and my family’s story. I had so many takeaways from our discussion that I know will help take this blog to the next level. As a first timer, be sure to take advantage of this great opportunity! Something I heard over and over again was “start small to get big”. For me, growing this blog doesn’t mean making money but making an impact. When I started this blog almost a year ago it was to share my family’s story to inspire others to pay down debt and eventually become financially free. Another common theme was to ensure I am sharing my personal story. This may seem obvious, but it made me realize that I’ve moved away from sharing my story. Finally, for me attending FinCon was about getting out of my comfort zone. I’ve been at the same organization for more than 11 years. With that comes a lot of experience and comfort in social situations. Being at FinCon as a new anonymous blogger put me at the very bottom of the totem pole. It was often uncomfortable. It was also a week of tremendous growth. Going to FinCon 2018 reminded me of why I started a blog in the first place. It was to inspire young families to pay down debt and live financially free. I want to help people think differently about money. This will be done by telling our personal story, sharing the stories of others, and providing best practices to achieve your financial goals. I read in another blog recap that your first year of FinCon is a blur because you end up spending most of your time making introductions and explaining the purpose of your blog. Then in future years it’s more like a high school reunion. That definitely seems to be the case as much of my time was spent meeting new people so they know that there is a real person behind my avatar. I have already purchased my ticket for FinCon 2019 and look forward to a great time in Washington DC! Glad you had so much fun at FinCon. I always love it there. I think your tips are right on target, especially about bringing business cards! I always worry that first-timers won’t think about that one, but they’re invaluable for getting your name out there (and remembering the names of new blogs to read). Thanks! I don’t think we had the chance to meet but hopefully next year. Exchanging business cards was a huge help to remember interactions with others. Such a great event! It’s a great experience. You’ll love it. I look forward to meeting you! Totally agree on the “meeting online friends is weird” in that it is so NOT weird because you know so much about them they feel like good friends already. Yes, it’s weird that’s it’s not weird which makes it kind of weird. Unless you know a lot about them and they know nothing about you, which is kind of weird, too. 🙂 Are you planning to attend next year?? Would be great to meet you! Hahahha fair. Then a little weird 😉 and a solid maybe to next year. Congratulations! I was also one of the winners of Rockstar’s scholarships to FinCon this year. I would encourage all new bloggers to apply for next year’s scholarship. Totally worth the trip! Thanks, Cindy! I totally agree. The FinCon experience was well worth it. 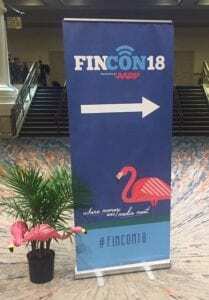 Are you planning to attend FinCon ‘19?